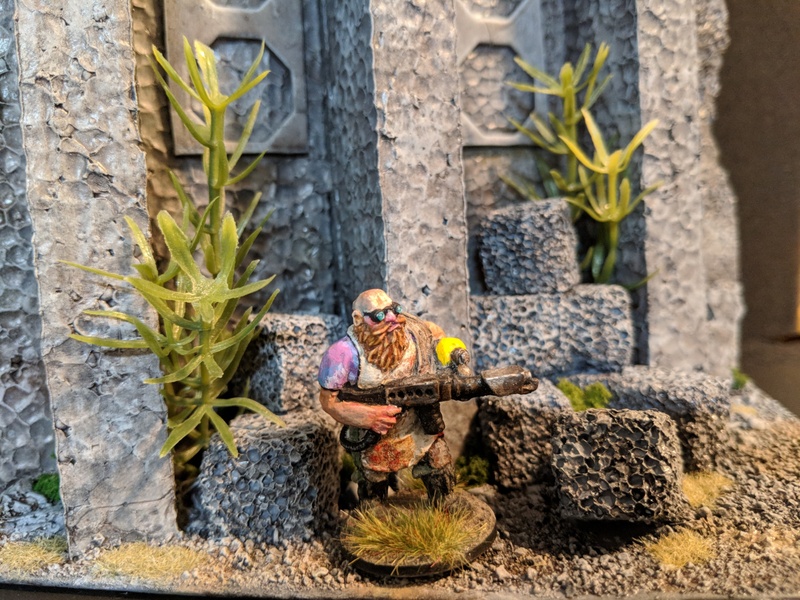 Recently I found some time to knock out a few terrain projects, as a bit of a palette cleanser as I churn through my backlog of Death Guard stuff. Up first are a pair of small resin scenic pieces from Armorcast. They’re industrial in design and could lend themselves to either a crisp, bold Infinity-themed paint job, or a crusty, rusty finish with lots of rust and weathering. Clearly, I chose the latter. Sidenote about Armorcast: I have a massive geek crush on Armorcast products, dating all the way back to my days in college working in a local game store. 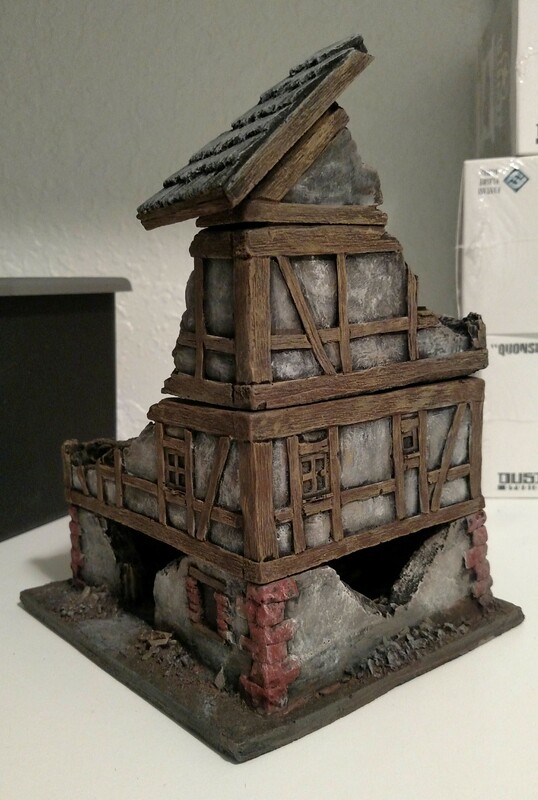 I was just dabbling in miniatures back then, and I remember being absolutely blown away by the stock of Armorcast terrain pieces — the quality, the variety … everything I saw was fairly bursting with potential, even in its unpainted state. 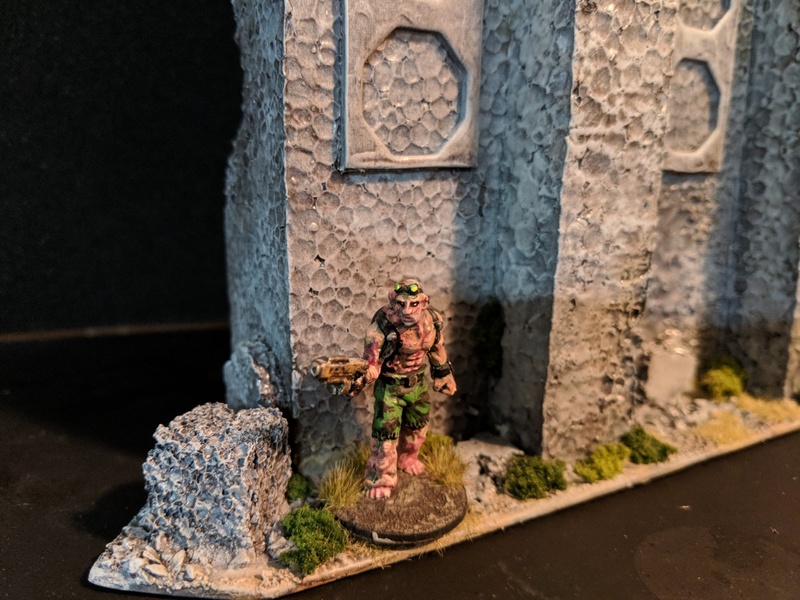 Those eggshell-colored resin sculpts were just waiting to bring your tabletop battlefield to life. Since then, I’ve made a habit to regularly scour ebay and various other swap sites in an effort to source more Armorcast stuff for my tabletop. That’s where these small pieces came from. Anyway, these two small items were a joy to paint up. I really went to town on the weathering effects. I’m usually a bit too timid to try them on “regular” models, like figures or vehicles for my Warhammer 40k armies. So I try to go hog-wild on small one-off projects like this, where there’s no pressure to churn out something that needs to blend in with an existing army. These pieces will make good scatter terrain, or even scenario objectives. Here I tried to convince myself that I could plop them down side-by-side to create a larger piece of industrial terrain, if needed. I think it’ll work! This next piece is nothing more than a massive slab of open-cell styrofoam that I chopped up, greebled and then melted with some spray paint. 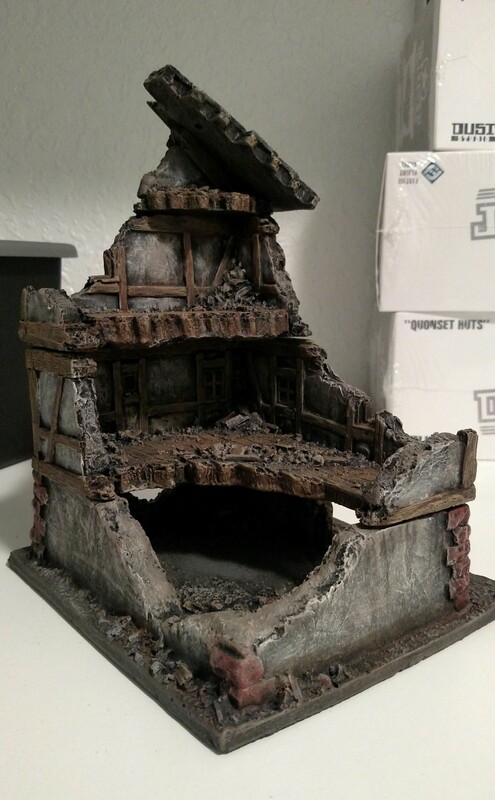 I built this piece months ago after a particularly egregious game of 40k convinced me that I needed some BIG, LINE-OF-SIGHT BLOCKING TERRAIN on my battlefield. Like, huge. Hence this big ugly mother. This got a super-fast paint job, followed by a splash of dark brown wash made from Future Floor Wax and some ink and pigments. It was my first time experimenting with handmade washes using Future, and it turned out OK — not great, but not abysmal. I’ll keep fiddling with the ratios and find something that suits me. Yes, this terrain piece is huge. Big enough to hide a Tau Riptide, even. At least once a year I try to complete everything on my workbench — that is, every single model or figure that’s been pushed to the periphery of my workspace over the last 12 months as I focused on other projects. This is usually something of a cathartic process, as it means I must consciously avoid moving on to other stuff and instead focus on finishing up leftover figures, loose models and nearly completed projects. It takes discipline, which is why I only do it once per year. Anyway, my scrapheap cleanup came along in April and I’ve just now finished up everything within reach. As always, it was a hodgepodge assembly of figures from various games and product lines. In order of when I completed them, here’s the roster. First up we have some individual soldiers for Frostgrave. You can never have too many generic soldier guys in Frostgrave. These were metal minis from Reaper that I got for 50% off years ago during somebody’s clearance event. I actually got two of this guy with the giant halberd. And this last Reaper figure is actually a woman! I always appreciate female figures that don’t have crazy exaggerated body proportions. Up next, I had three leftover Plague Marines from last summer’s ebay scavenger hunt. I’d painted up the rest but for some reason these three eluded me. Two are old-school metal Plague Marines from the early 90s, and the last is a modern sculpt from the Dark Vengeance boxed set … but I needed a Plague Marine champion, and he looked suitably gruesome, so he got the Nurgle treatment! Speaking of leftovers from the Dark Vengeance box, here’s another guy who I somehow missed during my feverish 40k painting period last summer and fall. He’s one of the Chosen from the set, and he looks like some sort of sorcerer to me, so that’s what he’ll be in our Grimdark Future games! The last piece from Dark Vengeance was the Chaos Lord himself. I’d waited a while before painting up this guy because, honestly, I see this figure everywhere. He is basically the go-to Chaos Lord model for many, many players, due to the popularity of the Dark Vengeance boxed set. But … he was on my workbench when I initiated this little project, which meant that I had no choice. I had to paint him up. As I was working on him, I started coming up with a little backstory. So instead of being a faceless, generic Chaos Lord, for me he is Mors Dunjen, Battle-Captain of the Night Lords and wielder of the accursed demon sword Languish. Sweet! I found a nifty resin base for him as well, with lots of embedded skulls and whatnot. Then I took a break to quickly rebase six energy wraiths for our Grimdark Future game this month. These guys were originally sold as “Frost Minions” for MageKnight, but I was able to carefully pop them off their clicky bases and rebase them onto proper scenic miniature bases. I based them on 25mm squares just in case I need to use them in a fantasy game like Dragon Rampant or Kings of War. The final model in this year’s clean-up-the-workbench initiative was another Chaos Lord … this time, a hulking warrior clad in Terminator armor and bearing a variety of exotic weaponry. The figure itself is an old metal blister pack that I acquired in a job lot. I liked the weird plasma cannon arm a lot, particularly the way the pipes seem to burst out of the guy’s shoulder pad like he ran out of room for all his equipment. So now I’ve got three possible leaders for my Night Lords warband, each tooled up for a slightly different purpose. There’s Estebohr Bruton, the Chaos sorcerer; Mors Dunjen, the Battle-Captain; and this guy will be known as Molitor Radlec, the Eschaton of Twilight. Anyway, by the time I was finishing up the Eschaton of Twilight, I was already starting to accumulate interesting figures and nifty side projects along the perimeter of my workbench. But! I finished this effort and briefly had a clean workbench to point to as a result of the last few weeks of work. That counts, right?